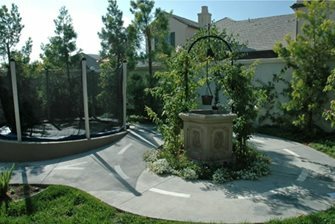 An in-ground trampoline is safer and more attractive. The trampoline in this children's play yard was recessed down to accommodate wheelchair access for a special needs child. A trampoline should always be placed on a soft surface such as grass. A net can also further improve your children's safety. Trampolines are loved by kids and adults of all ages. It's a great form of exercise and takes up little space in the yard. Trampolines vary in size from 8-14 feet in diameter. 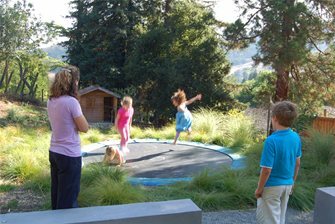 Lawns don't seem to survive well under trampolines so plan an area with gravel or decomposed granite for long term placement. 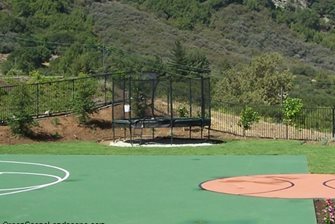 In-Ground TrampolinesMany parents worry about a trampoline because of safety concerns as well as the fact that they can be an eyesore. If this is you, an in-ground trampoline may be the right solution. 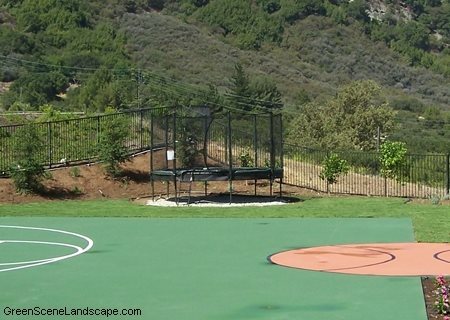 According to In-Ground Trampolines of Scottsdale, AZ, an "in-ground trampoline system is safer than the above ground systems because instead of falling 3 to 4 feet off of your trampoline you literally step off on to your grass or other impact absorbing surface." The trampoline project featured in the video at bottom right was designed by Joseph Huettl of Huettl landscape Architecture. This family opted for an in-ground system because it was much more visually pleasing. 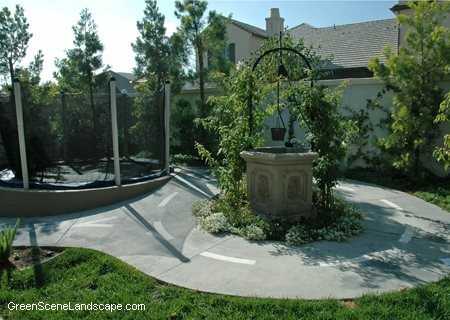 This trampoline was further hidden from view with low seat walls and native grasses. Huettl stresses the importance of drainage when installing an in-ground trampoline, or else you could end up with a pit full of water every time it rains.